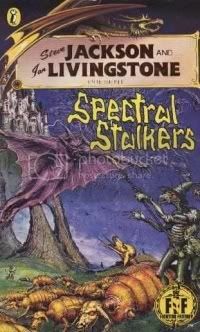 I wasn't sure what to expect from Spectral Stalkers, considering the god-awful cover and that I'd never read it as a kid. Surprisingly though, it was good, a little odd and definitely one worth replaying - I get the feeling I barely touched the surface in my playthrough, despite unwittingly making it as far as the 'final conflict'. Kind of. You start SS as an unemployed adventurer wasting what little money he has on tarot card readings, though it's hard to tell just how poor you really are - in the introduction your purse is 'full', then when the adventure proper starts, you have 'only eight' gold pieces. Them's either some large gold pieces, or you're carrying one tiny purse. The tarot reader gave me some unsettling news, and I was soon entrusted with the Aleph, a small globe that contains the entire universe in every dimension. There are some bad guys, the titular Spectral Stalkers, who also want it, and can detect my 'psychic energy' through a 'disturbance in the ether'. They're evidently of the Sith rather than Jedi persuasion, however, or so I'm told. I'm not sure what I'm supposed to do with this globe, but the guy who left me with it said the name 'Archmage Globus' as he died, so I assume, with this thing being a globe and all, I should find him. Did I mention the globe thing is magic, and lets you travel through dimensions and whatnot? I'm not sure why the mission, whatever it was, didn't end right there on page one - congratulations, you got the magic ball of awesome, turn to page 400? It transported me first to the Library in Limbo, which the dragon assistant tells me has every copy of every book ever written, kind of like Google but in real life, but in Limbo, which is apparently not a part of the universe the globe contains. Err, yeah. I ask the dragon about Globus, she tells me to find the 'Directory of Wizards' - it's a giant black book with 'Wizards' written on the spine. Hmmm. I soon find it though, it's as tall as a spear and opens to the exact page I need - I see the ether works in similar ways to the Force. Globus lives on the Ziggurat World, which sounds awesome, so I figure I'll try and find him as soon as I find a way out of this epic library. Wandering around, I come across the 'Office of the Artefacts Specialist' - thankyou, Force - and wander in, only to be hit by a bucketfull of water, left on top of the door. The Office of the Classic Pranks Specialist is manned by Wayland (Smithers? ), a grade-A clown. In some books a bucket of water would be 'refreshing' and accompanied by a stamina increase, not the decrease here. Ah well. Rejecting whatever is in the drink he hands me, I ask Wayland about the Aleph. He tells me once I'm back in the real world to keep moving to avoid the Spectral Stalkers, he's no idea who Globus is, and that now I have to leave Limbo, which is odd cause here in Limbo I'm safe from the Spectral Stalkers, and yeah, I don't even know what I'm supposed to do with the Aleph and yeah. Um, why do I have to leave? Anyway, a dwarf tells me to think about where I want to go as I step through the exit, so I think of the Ziggurat World, and and soon find myself there, just like that. I wasn't aware at this stage of the book the Ziggurat World is where the 'final conflict' takes place, but hey. A Spectral Stalker instantly appeared, but as I'd left no disturbance in the force at all by this point, it soon vanished. Why it would vanish upon finding you and not, I don't know, check to see if you had the MacGuffin, beats me. They seem to pop up regularly without even knowing I have it - is everyone else in this world similarly beseiged? Wandering on, I meet a bunch of Mantirs, like human manticores, who are pissed I killed one of the insect-bull things. Before we can finish our rumble though, a group of 'Black Shadows' come from the sky and begin carrying away the insect-bulls. They're definitely black according to the text, but are purple on the cover - try and work that one out! Anyway, the Mantirs curse Globus for the attack, which puts a little doubt in my mind as to whether Globus' intentions with the Aleph are wholesome. I run away, up a cliff apparently, cause that's always the best way to avoid things that can fly (?!). I spy some towers up on thin, rocky peaks, and assume Globus is in one - they're on the cover, after all. Unfortunately the Black Shadows are back, and without a purple one to make an example of I'm soon captured and poisoned down to four points of stamina. I awaken in a room tied to a pillar, among others facing a similar fate. The Black Shadows poison me again, down to two stamina, and carry me away. This time I awaken in Globus' throne room, and the book informs me this is the 'final conflict'. Err, I wasn't aware Globus was even a bad guy? Maybe those Mantir deserved it? Before I can think any more, I'm blasted by a laser of some sort and crushed to death. So... It's all a little mysterious, to be honest, but it seems that by thinking of the Ziggurat World on exiting Limbo, I've catapulted myself to the last phase of the book. What an odd mechanic. Others say there are loads of other worlds and times to visit, and whether the book works for you or not depends on how much you like the FF books that try to push the envelope a little. I for one liked what I read, and not knowing exactly what was happening despite making it that far into the book leads me to believe it has replayability in spades. If I hadn't read that giant Wizards book though, how would I have known to ask for the Ziggurat World in the first place? Maybe I should have taken the option to go back to Khul and live like an unemployed billionaire, or like a magic Quinn from Sliders. An oddity in the FF canon, but a good one. It's a fun book though, worth another look. Yep, definitely worth replaying, since you missed out pretty much all the interesting worlds in the book (between Limbo and Ziggurat). A really unique concept, one of my favourites too. The Trail concept does seem flawed, though, since most of the choices you make to avoid the Stalkers are pretty much common sense anyway, and you are highly unlikely to pick up more than 2 points (which makes it impossible for them to detect you in any situation).